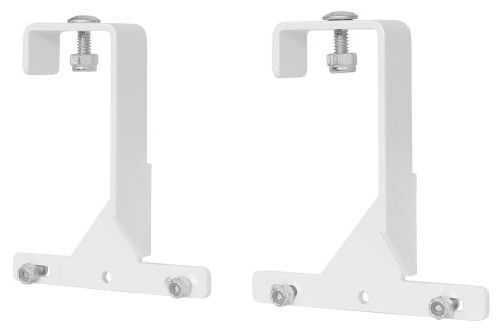 Sun System® Universal Reflector Uni-Strut Brackets safely hang your Sun System® reflector in a greenhouse or commercial application. Heavy-duty, bolt on mounting brackets are used to attach your Sun System® reflector to uni-strut/kindorf framing. Used for rigid mount applications for additional safety and support. May be adaptable to other strut/framing applications. These brackets are constructed of sturdy 10 gauge galvanized steel and powder coated to protect from wear and rust. Not compatible with reflectors that have handle style hanging brackets (Magnum XXXL® Gen 3 - 6 & 8 inch and the LEC® 315 and LEC® 630). US Patent: D779,312 and US Patent Pending: 29/533,943 and 29/590,384.